Over time, have come to realize that most of my readers are spread around various countries most especially Nigeria, South Africa, Kenya, Ghana and a loads of others. Today, I really have good news for my Ghanaian readers. 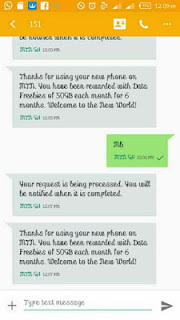 MTN Ghana is currently giving out a whooping 50gb worth of data to it's customers. What makes this more better is that the free data will be automatically renewed monthly within a period of 6 months. Note that this isn't really a cheat as you don't have to go through a long process or tweak any IMEI to get yours. 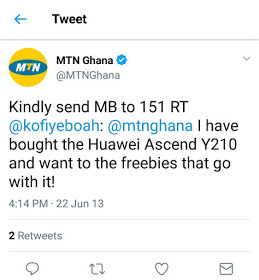 The data is actually a freebies that goes with the Huawei Ascend Y210 smartphone but you can still activate it irrespective of the smartphone you are using. >> All you need to do is to text MB to 151. Note that the data works on all internet enabled smartphone. If you find this helpful, don't forget to kindly share this on your various social media platforms.